It’s funny that I, who can’t handle graphic descriptions in books and rarely watch movies rated higher than PG-13, consider dystopian literature one of my favorite genres. What is dystopian literature? If you’re a fan of The Hunger Games or Divergent (which will soon be making its movie debut), you’re already familiar with it. Word history makes a little more sense of the genre’s odd name, though. A utopia is a perfect world (deriving partly from the Greek word ευτοπiα, meaning “good land”). Flip that on its head and you get a dystopia (δυστοπια), a “bad land.” The setting is often a futuristic or fantastical version of our own world–but something is very, very wrong with it. The exact type of wrongness varies. It can be a nationally televised event in which teenagers fight to the death. It can be an association of “firefighters” who work to burn books rather than save them. It can be a community that has rejected the burden of memory. All disturbing scenarios, without question. But it is that very ability to unsettle that makes dystopian literature so powerful. It makes us understand consequences. 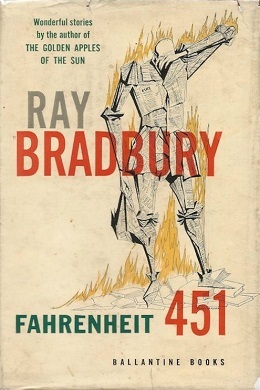 Fahrenheit 451 portrays the book-burning “firefighters” as a consequence of culture-wide entertainment addiction. The cold extermination of humans in The Giver is a consequence of a society that chose painlessness and order over compassion and mercy. What are the problems with our own society? What will the consequences be? And what can we do to change things? And that’s why I love dystopian novels–not because I’m a freak who loves to read about twisted worlds. I love these stories because I’m a person who wants to see the sickness of the world I live in and help prevent it from worsening past cure. I like these novels because they make me think, but more because they make me care. Maybe that’s why the genre has picked up so much popularity, especially in the turmoil of recent years. Although this is sometimes classified as a science fiction novel (and it does contain science fiction elements), its placement on an isolated island in our world, paired with its disturbing social commentary, make it a good example of dystopian literature as well. A power-crazed scientist makes humans out of animals, positioning himself as their god–but when the animals begin to regress, we must ask where the boundary between man and beast lies. Have you read any of these books? Or do you have another favorite you’d add to the list? This makes me want to pick up all these books. I think “Do Androids Dream of Electric Sheep” would fit on this list as well… sci-fi, but definitely dystopian as well, and one of my favs.